Plan to attend our last event in the Fake News series. 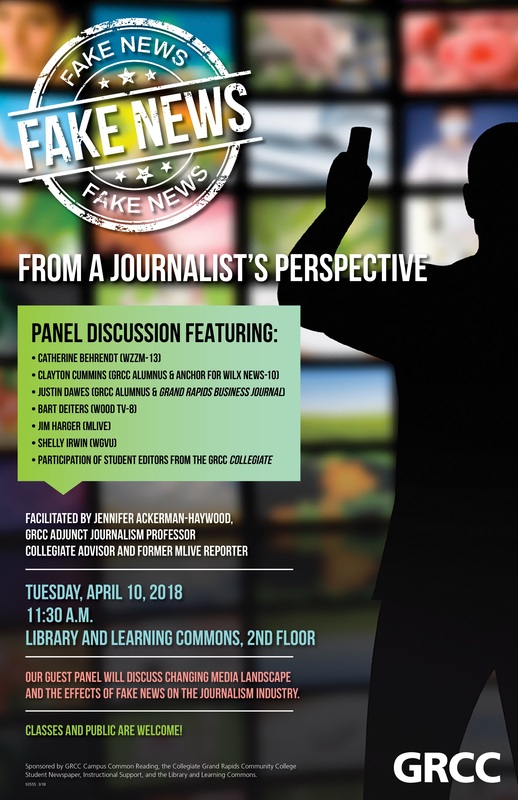 Facilitated by Jennifer Ackerman-Haywood, GRCC adjunct journalism professor, Collegiate Advisor & Former MLive reporter, a panel of journalists in various points of their careers will discuss our changing media landscape and the effects of fake news on the journalism industry. Tuesday, April 10, 201 | 11:30 a.m. | Library & Learning Commons (2nd floor, West). Sponsored by GRCC’s Campus Common Reading Committee, Dean’s Office for Instructional Support, Library and Learning Commons, Facilities, and Media Technologies. Open to the public. Refreshments!